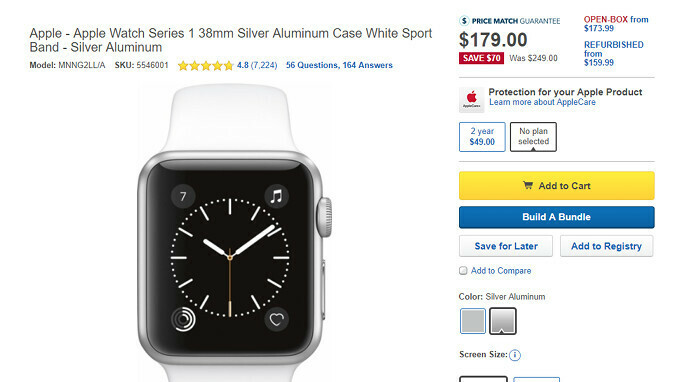 One of the older Apple Watch models is now part of a bigger sale at Best Buy. Various Apple Watch Series 1 models are now on sale at the US retailer for as low as $179, about 30% cheaper than the usual retail price. For example, the Apple Watch Series 1 42mm costs $209, although the smartwatch usually sells for $279. The smartwatch is available in either Space Gray or Silver color options. On the other hand, the Apple Watch Series 1 38mm costs just $179, exactly $80 less than the MSRP. Just like the 42mm model, it's available in Space Gray and Silver colors. Prices are even lower for open-box models, so if that doesn't bother you, then you can grab the Apple Watch Series 1 42mm for just $178. Also, the open-box Apple Watch Series 1 38mm is on sale for as low as $161. Not sure how long the deals will be available at Best Buy, so you better hurry if you want to buy an Apple Watch Series 1 at a much better price than usual. A few months ago I finally got into the digital watch craze, but in a cheapskate way: bought a used series 2 42mm stainless steel with milanese band for AUD $170 - yeah, watch was in a bit of a beaten up condition, but still worked fine - and I have a jeweller friend who is a master at polishing watch cases, so no worries with the aesthetics. Well, at least initially the watch worked well...but after a few weeks, the digital crown would not give a responsive click when pressed in, though it would click on the way out. But after checking the serial number...AppleCare still had almost 7 months to go, and of course Applecare is linked to the product and is fully transferable! And say what you want about Apple, they stand by their products as long as you're not a total hick. Handed it in for assessment Tuesday afternoon, and that Friday got a message to pick up a brand spanking new 42mm stainless steel series 2. All for AUD $170, or about USD $130. Sweet! Watch this Series One get discontinued this fall.